Our family moved to a new home this weekend, and one thing I’m delighted about is we’ll now have room in our kitchen to display our many cookbooks. Last night, my wife and I were sitting on the floor of the kitchen surrounded by a half dozen boxes, filing our cookbooks onto our bookcase. And then we got to Molto Italiano by Mario Batali, a book I’ve owned for 12 years. It’s one of the most sauce-splattered books in my kitchen, and one of my most treasured. It was a lamb ragu recipe I used on date no. 3 that’s the reason the woman on my right is sitting cross-legged besides me in our new home. 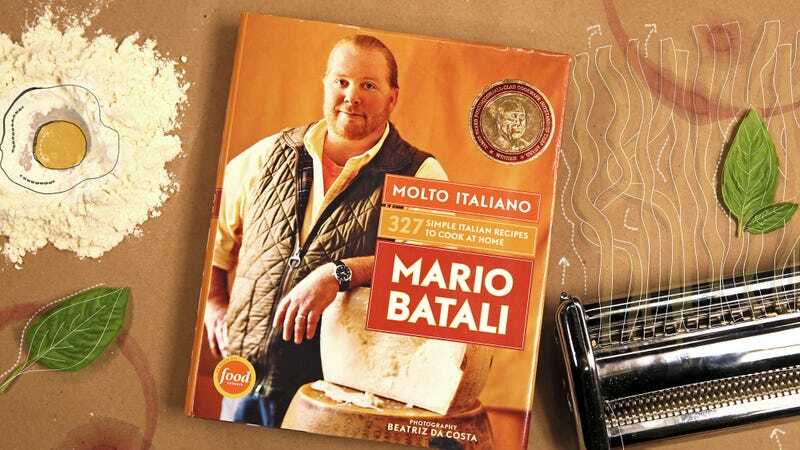 My wife took one look at that book with Batali’s mug on the cover, and said: “We can’t have this book in our kitchen.” I replied: “But we use this cookbook all the time!” She shot me a look, and that was that. Back into the basement the book went. Mario Batali has been in the news these last six months, and for all the wrong reasons: Both Eater and The Washington Post in December published a report alleging Batali of sexual misconduct and abusive behavior. Then came news that Batali’s name was too toxic even for the company he founded. And just last week, 60 Minutes ran a segment, which—among new allegations of sexual assault—revealed that Batali is currently under investigation with the New York Police Department. (Perhaps coincidentally, news came Monday of Batali’s Las Vegas restaurant being shuttered.) Batali isn’t the only chef whose careers have been brought down by revelations of assault and harassment. When it comes to our cookbook situation, there are two dilemmas at play. First is whether to display the book in our kitchen—this was solved because we own more cookbooks than have shelf space, and so the surplus goes downstairs with the overflow. The bigger question is whether I should cook from that book ever again. It’s not a black-and-white answer. On one hand, the recipes in Molto Italiano have brought my wife and I much joy over the years. And Batali himself isn’t profiting more from a book I purchased in 2006. The question, then, isn’t dissimilar to whether I can in good conscience watch a Woody Allen film, or feel compelled to change the radio station if an R. Kelly song comes on. I love Arrested Development, but it’s yet another once-beloved work that I can no longer watch without cringing—not because of what happens within the fiction itself (cringe comedy of the highest order) but because one of the key people associated with it has been accused of heinous behavior. I can’t say that the show quite is on the “See No More” list alongside House Of Cards or Woody Allen’s movies, because Kevin Spacey is in most of every House Of Cards episode, and Woody Allen is responsible for every frame of a Woody Allen movie, whereas Tambor’s presence only becomes oppressive when he’s onscreen as George Bluth Sr. or his twin brother Oscar Bluth. But Tambor has just enough screen time to taint any goodwill you might feel for the work. Should I sell/give away cookbooks by authors with a history of predatory behavior, because I’ll feel a twinge of queasiness cooking from it? Does it ever get to the point where I stop cooking recipes from those authors altogether? I can also look at it this way: I’ve used those Mario Batali recipes for years because they work, but surely there are better versions that yield more delicious results. Maybe this is just an excuse for me to branch out and try a different recipe? It’s not like I don’t have enough cookbooks in my kitchen to choose from.